The TS250 waveform amplifier is a unique instrument ideal for amplifying function generator output. It amplifies current or voltage or power for driving heavy loads. The TS250 output current up to 6A peak for the low-voltage model. Higher current is possible by connecting two or more TS250 in parallel. The TS250-7 output is up to +65V. Electromagnetic coils such as solenoids, inductors, Helmholtz coils, and electromagnets often time required high-current and high-frequency operation. The TS250 is ideal for driving magnetic coils at high current and high frequency. Similarly the TS250 is also ideal for driver high capacitance piezo actuators. TS250 can source or sink current. It can be use as a battery simulator. The TS250 has a variable DC output that can easily simulate battery voltage changes. Thus it is great for battery charger testing such as those in battery operated portable electronic systems. TS250 is ideal for power supply rejection ratio or PSRR measurement. PSRR is commonly tested for LDO regulators, op amps, audio amps, etc. 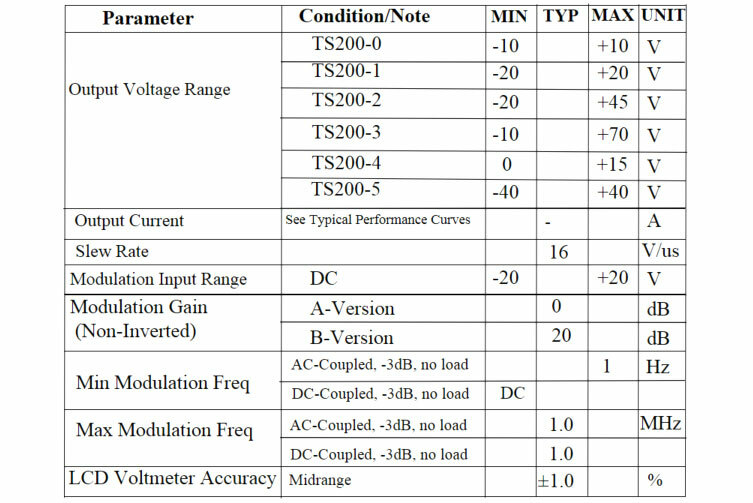 TS250 is especially powerful for LDO PSRR testing at high load current (See below App Notes). The TS250 can also test op amp PSRR and CMRR. It is designed to work with network analyzers such as Omicron Lab Bode 100, AP Instruments (Ridley) model 300, Agilent 4395A, and Audio Precision SYS2722. 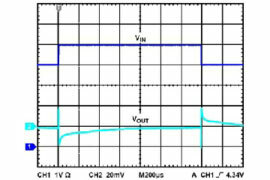 Transient response is an electrical specification of how a device-under-test (DUT) response to an input voltage disturbance or transient. For example, a regulator specified its output voltage deviates less than 5mV for a 200mV input voltage step from 3.2V to 3.4V in 10 microseconds. This is also called line step response. Another example is to simulate a supply voltage transient rapidly overshoot follow by a suddenly loss of power. TS200 can source or sink current. It can be use as a battery simulator for testing battery chargers. The TS200 has a variable DC output that can easily simulate battery voltage changes. Thus it is great for battery charger testing such as those in battery operated portable electronic systems. The TS200 Modulated Power Supply is a unique test equipment ideal for amplifying function generator output. It amplifies current or voltage or power for driving heavy loads. The TS200 output current up to 4A peak for the low-voltage model. The TS200-3B output is up to +70V. Electromagnetic coils such as solenoids, inductors, Helmholtz coils, and electromagnets often time required high-current and high-frequency operation. The TS200 is ideal for driving magnetic coils at high current and high frequency. Similarly the TS200 is also ideal for driver high capacitance piezo actuators. TS200 is ideal for power supply rejection ratio or PSRR measurement. PSRR is commonly tested for LDO regulators, op amps, audio amps, etc. TS200 is especially powerful for LDO PSRR testing at high load current. 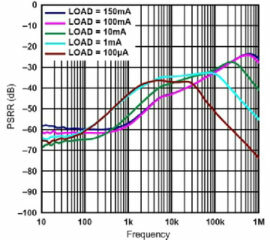 TS200 can also test op amp PSRR and CMRR. 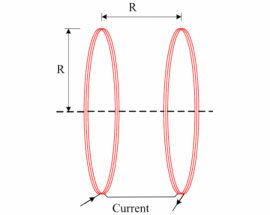 Conventional regulator PSRR test techniques such as capacitor or inductor coupled unable to support high LDO load current (i.e. 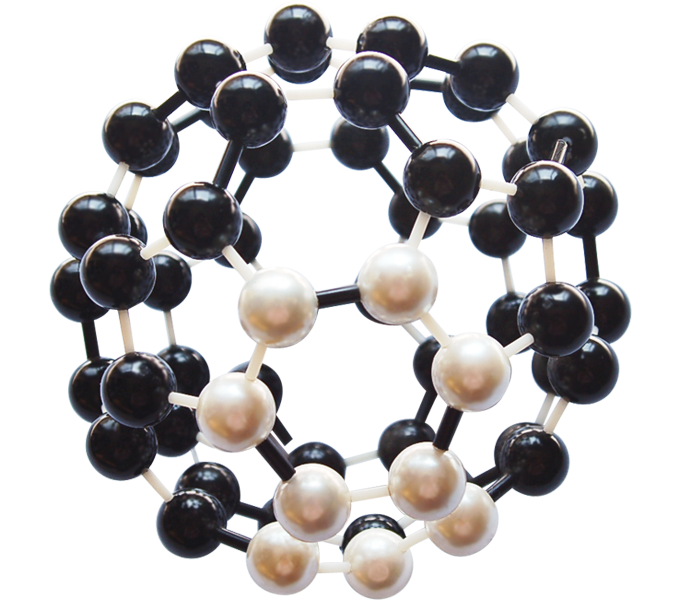 >1A). Various PSRR measurement techniques are outlined below links. The TS200 is designed to work with network analyzers such as Omicron Lab Bode100, AP Instruments (Ridley) model 300, Agilent 4395A, and Audio Precision SYS2722.